Texas Nebelung Rescue View other Nebelungs for adoption. Hi! 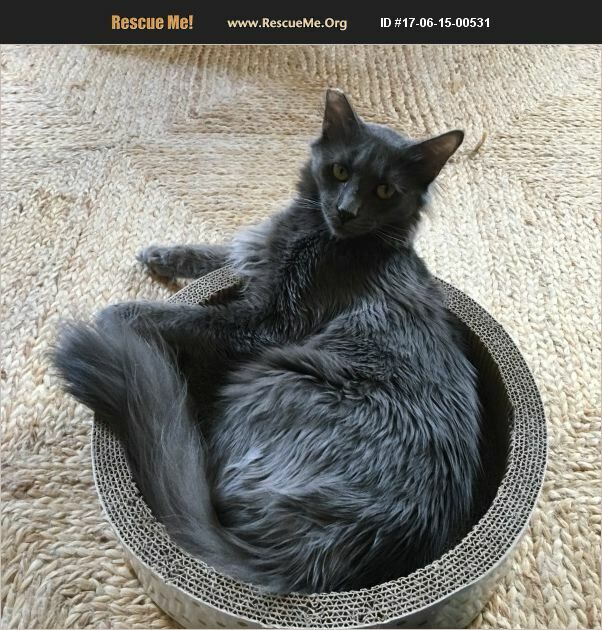 My name is James, and I'm a sweet, calm, playful, sociable gray Nebelung, which is a medium-haired Russian Blue, mix fella with a big fluff of a tail who was born in October 2016. Watch the attached YouTube video that appeared on Animal Planet to learn more about Nebelung mixes. I was rescued from a feral colony with my brother Jessie when we were kittens. A nice lady decided that we were too little to stay there and fend for ourselves. I was so relieved to kiss my hardscrabble life good-bye and to start living inside with toys, beds, and all the food I could ever want! I am a happy-go-lucky, outgoing fella who loves being petted and playing with my foster meowmy when she engages me with interactive toys. Not only am I bonded to my bro Jessie, but I love other cats. I would even be great in a home with dogs and kids, so there are plenty of family situations in which I would fit beautifully. I'd love to meet you so you can see how cute, handsome, and wonderful I am, so come meet me (and my brother James, for that matter!) today! Let's write a new chapter in our lives together!! James is updated on shots, neutered, dewormed, microchipped, FIV/ FeLV negative, and ready for his indoor-only home. No de-clawing permitted. His adoption fee is $100 (or $175 for the bonded pair), cash or check payable to Buster's Friends. Please click the contact button if you are interested in James, and we can let you know exactly where you can meet him. To adopt one of our cats, you must fill out our adoption application and be approved by one of our adoption counselors. To make the process more efficient, download the adoption application at http://www.bustersfriends.org/catadoptionapplication.shtml. First save and then open it; then you can print it and fill it out.